There is a $25.00 Range Fee associated with this class payable to The APOSTC Law Enforcement Academy Tuscaloosa. Our Hallmark Instructor Program provides the necessary training for a changing world. This course is comprised for four 8-hour instructor level classes covering OC Aerosols, Impact Munitions, Chemical Munitions and Distraction Device Munitions. The student will acquire Instructor Level knowledge of Defense Technology products, both technically and tactically, along with the skills necessary to conduct in-service training. Each of the four class modules focuses on a different subject and includes a half-day of lecture-based studies followed by a half-day in the field for deployment drills. 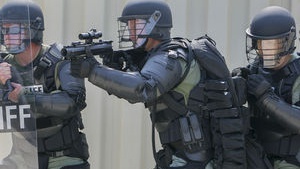 Unique to this class – the state-of-the-art deployment tactics come direct from the manufacturer of the products used. Students have the option of taking each module individually, or registering for all four modules for a discounted price of $895.00. Upon completion of the course and successfully passing the final exam, the student is authorized to provide in-service training to their agency in specific areas for 36 calendar months from the testing date. In each topic, the student will receive a CD containing presentation materials and videos to be utilized by the student when training in their own departments. Prerequisits & Required Equipment Each attendee must be in good physical condition and able to perform the practical exercises associated with tactical applications with the use of these products. The Safariland Training Group trains only sworn law-enforcement officers, correctional personnel, state-licensed security personnel (OC only) or active military personnel. Fit for Duty Each of the four modules in this program involve practical exercises. Students are required to actively participate in these exercises as part of their instructor-level training. Students should be in good physical condition for these classes in order to ensure successful completion of the courses. Some of these courses involve exposure to chemical agents as well as the physical exercises. Students with physical conditions that may impair their ability to participate are responsible for contacting their physician for medical clearance prior to enrollment. Conditions requiring such consultation include but are not limited to high blood pressure, heart problems, lung problems, to include bronchitis and asthma, or allergies. All students in this course are exposed to OC as a requirement for their instructor training. Students who have undergone any type of eye surgery in the past 12 months must notify the Safariland Training Group prior to enrollment in an OC course. Typically, patients who have undergone eye surgery require approximately six months for complete recovery. In order to provide the greatest safety margin, Safariland has therefore concluded that any student who has undergone eye surgery is STRONGLY advised to delay participation in this class for a full calendar year from the date of surgery. Safariland, LLC will not assume responsibility for any students who do not seek medical consultation prior to course participation. Any student who is unable to participate in the exercises cannot complete this instructor level course. It is incumbent upon the student to ensure they are physically capable of meeting the requirements of the courses.